Donald Ray Clute was born March 4, 1942, in Madison County to W.L. and Mable Walrath Clute. He graduated from Madisonville High School in 1961 and attended Blinn Junior College. 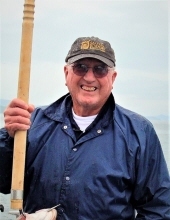 He died at home surrounded by family on November 17, 2018. Donald was preceded by death by his parents, W.L. and Mable Clute, sister Joan Rush, and brother Calvin Clute. He is survived by his wife of 54 years, Peggy Waller Clute, daughter, Lisa Clute of Austin, daughter, Jennifer Clute Ivy of New Braunfels, grandchildren, John Matthew Ivy and Mackenzie Ivy of New Braunfels, sister, Marie Nash and Tolbert Nash of Leona, sister, Linda Carpenter and T.W Carpenter of Houston, sister in-law, Pat Hayes of Conroe, and numerous nieces and nephews. Donald retired as a security guard from Texas Department of Corrections in 1993. He spent his last 25 years doing what he loved most, refinishing antique furniture, wood working, gardening, raising flowers, and cooking for family and friends. His pumpkin cheesecake was legendary. He was an excellent steward of the land, nurturing plants and animals and creating a sanctuary on his family’s homestead. Over the years, Donald volunteered for several organizations. He served as a coach for girls softball, soccer, and basketball teams, and he was a founding director of the local Girls Little Dribblers organization. A celebration of Donald’s life was held on Tuesday, November 20, 2018, with a graveside service at Park Cemetery. In lieu of flowers, friends may consider memorial donations to the Park Cemetery Association, 1558 Baker Lane, Madisonville, Texas 77864. To send flowers or a remembrance gift to the family of Donald Ray "Buddy" Clute, please visit our Tribute Store. "Email Address" would like to share the life celebration of Donald Ray "Buddy" Clute. Click on the "link" to go to share a favorite memory or leave a condolence message for the family.